This aromatic premium gin is the essence of an English summer. The contemporary twist of cucumber combined with a delicate juniper base is good served over ice and taste good with fresh coriander and mint. Cucumber Gin is available nationwide in Majestic, Ocado, Independent off licences and farm shops and delicatessens, or directly from The English Drinks Company. Follow The English Drinks Company on Twitter, Facebook and Instagram. The luxurious Irish cream liqueur from Feeney's with a fresh, sweet, smooth flavour. 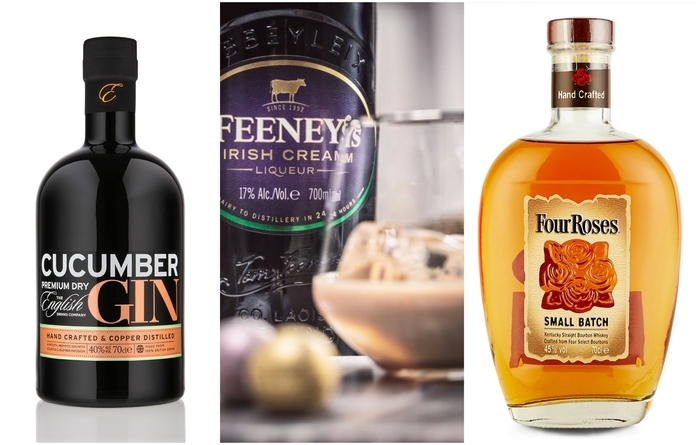 Contains rich dairy cream and real Irish grain whiskey that is matured for at least three years and masterfully distilled in the heart of Ireland, which together deliver a unique taste experience. Follow Feeney's on Twitter, Facebook and Instagram. A mellow symphony of rich, spicy flavours along with sweet, fruity aromas and hints of sweet oak and caramel from the USA. Follow M&S on Twitter, Facebook and Instagram. This is a delicious juniper-led gin with a savoury, spicy twist. Notes of sweet orange and citrus are enlivened by an infusion of red cole (horseradish), which gives this gin its distinctive character. The signature cocktail is a 'Tom and Tonic' with an orange peel twist, but it would also be great in a Bloody Mary. A clear and pure rum with light and floral with subtle coconut and fresh banana Flavour: Rum, toasted coconut, vanilla pod and cocoa, with a nutty and smooth finish. Pour it over coconut water ice cubes, team it with apple juice, make a colada, espresso martini or mojito with the run. Designed by wine lovers from the Californian wine growing region, the ZOS completely expels oxygen from an opened bottle of wine, preventing the oxidisation that spoils the flavour of your wine. Super-easy to use, there’s no need to inject gas or pump like crazy to create a vacuum – just insert it into the neck of your bottle and leave it standing upright in the fridge or in a corner of your kitchen. The special ZOS cartridge is filled with a specially formulated clay compound which absorbs 100% of the oxygen in the bottle. 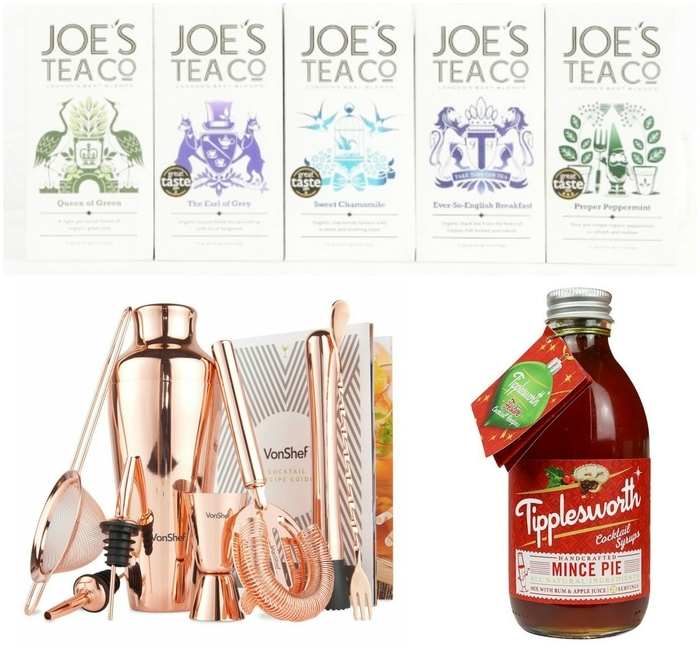 A selection of Joe's bestsellers and personal favourite blends. A box of 15 of each of their five organic teas in good-to-go pyramid bags. Blends - Ever-So English Breakfast, The Earl Of Grey And Queen Of Greenand Herbal Infusions - Proper Peppermint And Sweet Chamomilein Fuss Free Pyramid Bags. Beautifully designed 550ml capacity Parisian cocktail shaker – premium stainless steel construction with contemporary copper finish. Complementary copper-coloured accessories included: stainless steel muddler, 9"stainless steel twisted double-ended bar spoon/ fork, stainless steel Hawthorne strainer and double ended stainless steel 25ml/50ml shot measuring jigger. Includes a cocktail recipe guide to get you started and supplied in a gorgeous gift box. A delightful twist on a Christmas classic. Mix into a 'Mince Pie Martini' using rum and pressed apple juice. Made with all of the same ingredients used to make a mince pie filling. All natural and no artificial flavourings. The Üutensil Stirr lends a welcome hand in any kitchen. For any sauce, porridge or gravy that needs constant attention on a slow and low heat, the Stirr can be left to it at the push of a button. Single-handedly place Stirr into your pan and choose between 3 speeds, then you can get on with something else without worrying about your food catching on the base of the pan! Conveniently the base of Stirr clicks off to put into the dishwasher. Just wipe clean the motor unit where necessary. It is cordless and takes four AA batteries. Available also in grey. As with all Üutensil products it comes with a 5 year guarantee. Joe & Seph's are a family business, based in London, whose mission is to make the best popcorn in the world. This filled biscotti jar gives you the opportunity to taste their handmade popcorn and make your own judgement. Dobbies' bespoke range of artisanal, award-winning food products can be gift wrapped to make the most considerate gifts this Christmas. Indulge yourself in the real taste of chocolate in a spread! With its perfectly creamy consistency, you can ooze our delicious Organic Dairy Free Chocolate & Hazelnut Spread into frozen yoghurt, spread thickly onto toast, or simply dig in with your spoon (we know we do!). Mr Organic’s Dairy Free Chocolate & Hazelnut Spread promises a deeper flavour and a genuine high-class quality. We blend rich cocoa with rice creamer and toasted hazelnuts grown in northern Lazio, Italy; a well-known region for cultivating the gentle ‘Nocciola Romana’. This gives our spread its sweet, nutty taste, to be enjoyed purely for your pleasure. A wonderfully presented Natural Chocolate Making Kit which is an ideal gift box for all the family. It includes Goji Berries & Brazil Nuts and has everything you could possibly need to make your own Natural Pure Chocolates. Includes recipes & instructions. 100% pure botanical ingredients, absolutely nothing added. Makes 20-25 small chocolates. Delicious delights await within the Ultimate Collection hamper. All the chocolate is made in England in small scale batches. 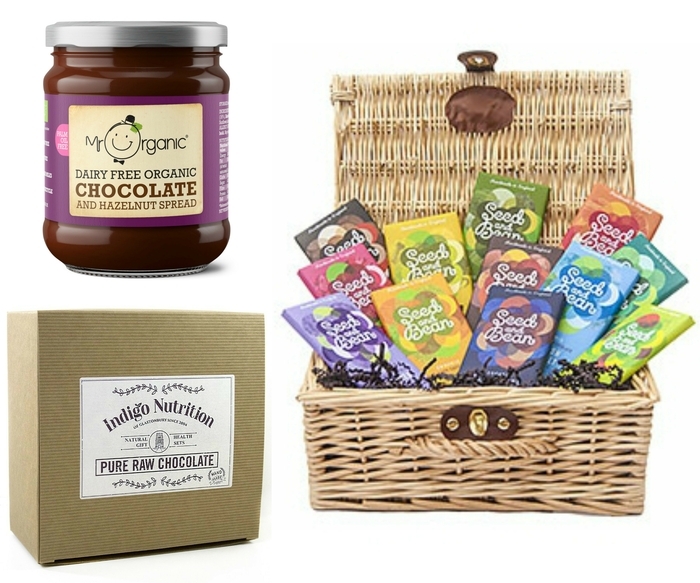 This hamper contains 12 chocolate bars within a lovely wicker basket perfect for keeping in a cool dark (secret) place for all your favourite chocolates. Bars - Aromatic Fennel, Chilli & Lime, Coconut & Raspberry, Coffee Espresso, Cornish Sea Salt, Extra Dark, Hazelnut, Lavender, Lemon & Cardamom, Mandarin & Ginger, Mint and Orange & Thyme. A vegan panettone made to an artisan recipe in Milan from 100% Italian extra olive oil, wholegrain flour and raisins. This cake only contains natural organic ingredients. The perfect addition to your Christmas table. Grown on the high slopes of the Andes, the amazing Maca is known as the “fountain of youth” in its indigenous Peru. Incans first used it 3000 years ago for its energy and endurance enhancing qualities. Still used by the people of Peru today, modern nutritional research has confirmed its powerful properties and has made its use a global phenomenon. Cacao Nibs are delicately broken-down chunks of the cacao bean, one of nature’s greatest sources of anti-oxidants and rich in many minerals, particularly iron and zinc. Cacao is well known for its positive affect on the brain, with it containing precursors to special neurotransmitters which help to increase circulation and availability of 'mood chemicals' such as serotonin, thus improving mood. 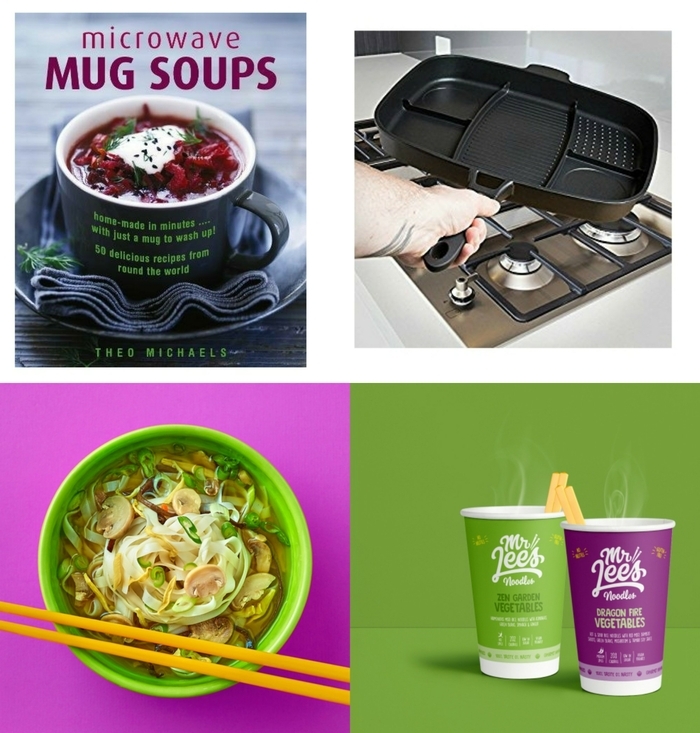 Every soup in this cook book by Theo Michaels has been specially created to be made in the microwave and to be cooked in a single mug, so it's ready to eat. Instead of opening up a can, you can delicious homemade soup super quick. JD Bug Scooters launched in the early 2000s when foldable scooters first became popular alongside the Micro brand. JD Bug Scooters feature a number of things that make them perfect for taking around and for easy transport. Firstly, the scooters are easily foldable, meaning you can store then neatly of carry them when not in use. A number of the scooters come with carry straps, again allowing you to transport the scooter easily when not in use. They're all built to last, using high grade metals, meaning that your JD Bug should last a few years if looked after properly. All the stunt scooters spin 360° and are perfect for testing your mettle down at the skatepark. Stunt scooters are also known as trick scooters; therefore they are built with reinforced parts to withstand the force exerted on them while being used for tricks and stunts. 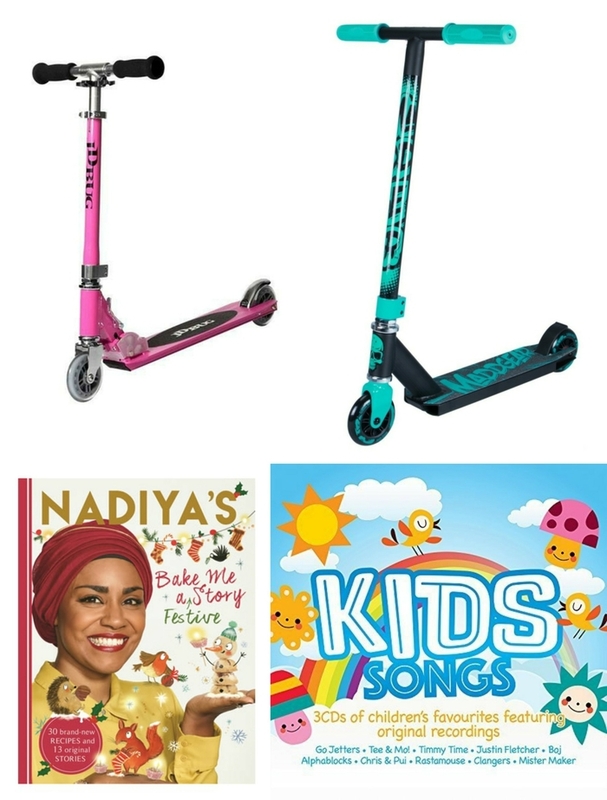 Note: winner can either choose a kids or adult scooter. Kids Songs offers 3CDs packed full of Children’s Favourite TV Themes and Songs. Available in a slim digipak featuring the original recordings from Go Jetters, Tee & Mo!, Timmy Time, Justin Fletcher, Boj, Alphablocks, Chris & Pui, Rastamouse, Clangers, and Mister Maker. The Mini Hornit is the ultimate lights and sound effects accessory for children's bikes and scooters. Loaded with 25 sounds and white and green lights, your child's imagination will run wild. The Sun and Moon Crimson Invasion trading cards are 60-card pre-constructed decks designed to introduce players to the Pokémon Trading Card Game and allow them to play right away. Available from all good retailers! Every day is an adventure with your own loyal Pokémon plush! It's tough enough for a play battle and soft enough for bedtime! This Canon Pixma iP2850 Printer provides high quality photo printing at affordable prices. Features USB compatibility for a high speed connection to your PC device. Achieving a print speed of 8ppm (mono) and 4ppm (colour), and a resolution of up to 4800x600 dpi, the Canon Pixma iP2850 is ideal for producing high quality photo prints quickly and efficiently. 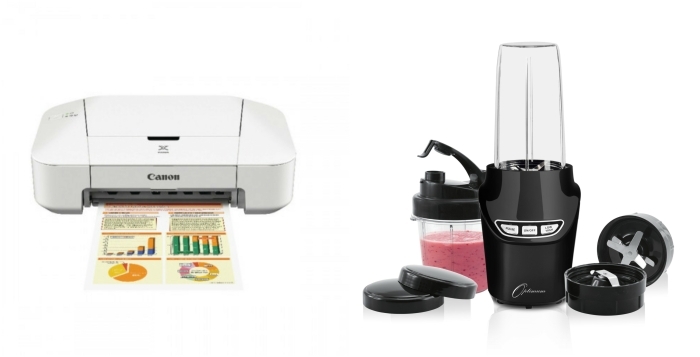 Say goodbye to having to choose between the morning rush hour or going to work without a nutritious breakfast, Your healthy breakfast smoothie only requires 50 seconds – just screw on the flip-top lid and you can be out the door. Need a quick energy fix after the gym? No problem. Make your energy-boosting smoothie ahead of time and screw on the stay-fresh travel lid. You can come home from the gym to the perfect post-workout smoothie straight from the refrigerator. Need to head right out after the gym? Just switch to the flip-top lid and you can be out the door again. 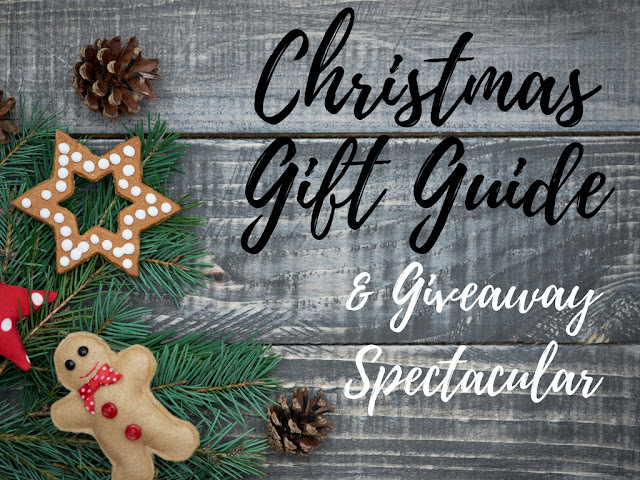 So a great gift guide and 27 amazing gifts worth over £800 for one lucky winner to win for a second Christmas in early January when the winner will be announced. To create this amazing giveaway I collaborated with some fabulous brands. It does however mean the winner will get to know their postman well with lots of parcels arriving. Please be aware of this before entering. Leave a comment at the end of this post telling me what your favourite part of Christmas is. Enter via the rafflecoper box below, looking out for extra entries. This giveaway is open to UK residents who are 18 or over. This giveaway will close on 2 January 2018 and one lucky winner will win all the prizes which will be sent out individually. If an item is out of stock, the brands reserve the right to replace them with a similar item of same or higher value. Make sure you also enter my Stellar Rocking Pan Giveaway. Disclosure: The brands are providing these prizes in good faith. I have not received payment or product to host this giveaway. This is purely a thank you for my readers. My favourite part of Christmas is putting together my family's yearly gingerbread creation with my siblings - each year it gets more elaborate, last year we made a pirate ship! dinner and it's back to square one at Tea time! Roll on January! Opening presents on Christmas morning and having a special Christmas morning breakfast. Just the time spent together. Last thing on Christmas Eve, trying to put the Santa sacks out without shaking the little bells on them and waking everyone up! Whose idea was it to put bells on them?! I adore everything about Christmas, but making memories with family is most important. This year we want to make it extra special after finding out about a family illness. My favourite part of Christmas is lunch with my family on Christmas Day. wow a great prize for the lucky winner! The best part is getting to spend extra quality time with my other half and family. The simplicity of giving, Christmas brings' out the good in people, it's like people change from a larvae to a beautiful butterfly, and why not! Christmas is a lovely time for people to relax and enjoy! Having my big baby come home from Uni, so I can be with both my girls. Being able to consume vast amounts of marzipan, without fear of being judged. We sit around a highly decorated Christmas lunch table with all my family, children and grandchildren and scoffing ourselves silly. Then party games until the youngsters fall asleep superb! Being off work and having fun family gatherings that make fab memories! I love sitting down to our Christmas meal with the family. It's a great opportunity to get together and enjoy each other's company with nice food and wine. I love watching my kids faces when they open their presents. Having a special day off from work, as I will be working after christmas day! Getting all the family around for Christmas dinner. Love having the whole family under one roof (worst and all) that makes me so happy! The Christmas films and music - followed by the foooooood. Is he 'the late' now? He was interviewed in the November issue of Classic Rock magazine (where he talked a load of political rubbish) and I haven't heard any news stories about him since, so I'd be surprised if he'd gone and Team Rock (who publish Classic Rock) hadn't put a news story up about it. My favourite part is sitting down to our first full Christmas meal by candlelight on Christmas Eve - everyone is home safely and there is such a happy air of anticipation. Christmas lunch with the family - easpecially when my daughter has cooked it! I love sitting down to Christmas dinner, I look forward to it all year long! Having an excuse to do absolutely nothing! for me its seeing the excitement in my 3 boys face, from the moment the tree goes up to the visit to santa, to dancing around the front room to christmas songs to curling up on the sofa watching festive films. I like that the whole family gets together at one house and has fun. Christmas dinner with good company! Putting the decorations up and discovering old ones you'd forgotten about. My favourite part of Christmas is watching the kids opening up their presents Christmas morning. My favourite part of Christmas is the full turkey Christmas dinner with all the trimmings, and eating loads of things with marzipan in them or on them! Spending time with family and having christmas dinner together. christmas markets, lights and decorations! just magical! My favourite part of Christmas is getting to spending time with my family and friends. The delicious tastes and smells! I love christmas food! I love it all! The Hectic shopping for presents and toys, the music and decorations. The food, especially the deserts. But my time is Midnight Christmas night when the kids are tucked up in bed after all the excitement and i head of at midnight to queue for the boxing day sales! Just getting to spend some time with my family! I think I have two favourite parts, wrapping the presents watching Christmas films and Boxing Day, love the relaxed feel when you reach Boxing Day. My favourite part of Christmas is being together with my favourite people. Getting together as a family and having a lovely big Christmas dinner! Eating a whole box of Jelly Belly's and drinking vodka in the day time! I love my 5am doggie walk over the meadows on christmas morning. so peaceful and quiet and lovely knowing that the festivities start as soon as we return home. It has to be Christmas Dinner. My favourite part is the excuse to overeat without feeling bad. Christmas is about appreciating family and friends, and the spiritual dimension of being together. I have a family buffet every year for as many family and friends that can come and when I hug them and see the happy little faces of the children that's when I realise how lucky we are - that's the best present of all! I love the food too. And the time with friends and family of course. And food. Finishing my meal:) Enjoying good conversation with the family around the table with full bellies. Contact with loved ones and the feeling of having passed the shortest day. Watching the excitement build as the presents are spotted. Seeing the kids enjoying their gifts. Christmas dinner. A day off for all in retail before the poor things have to gear up for the Boxing Day sales. Eating the christmas dinner,there's nothing better than eating it with your family and pulling christmas crackers. Sitting down after lunch and making Christmas treats with my chicks. I love watching my son sing in the carol service at school and putting the Christmas tree and decorations up with him on December 1st. My favourite part of Christmas is the decorations. I just love the different colours styles and sparkly bits. The lights add the finishing touch and I always go overboard when I decorate the living room! to be honest - when it's all over! The excitement of the kids on Christmas Eve! I love everything about it, especially the preparations - making the cards, cooking the cake, pudding, sauces and stuffings and decorating the tree. The Christmas dinner, and handing out presents to loved ones. My favourite part is the day it's self being cozy indoors with my family and everything I need when the rest of the world seems to stop outside! Love the lazy down time with family, the talk games and fun. I also love the fab food. I love the anything can happen atmosphere that there is around Christmas. You can dress your dog as a reindeer, the grumpiest of people will throw on a Santa hat (even a Bah Humbug one) and get into the spirit! Men relish dressing up as old women becoming the star of the local panto. You can even disguise your bin bags as Christmas puddings if you want to. We all let our guard down and relax a bit more around the festive time and that is what I love. Every year I make a wonderful christmas pudding and get the grandchildren to stir in a 1906 old sixpence which has been passed down through the generations, whoever finds the sixpence when eating pudding gets a lovely present and is exempt from washing up ! Christmas Eve watching Christmas classic movies with my children with all the tree lights twinkling, magical! Precious time with family and friends....and not working! Spending the day with family watching Christmas tv and eating chocs. Mulled wine, holiday from work, and getting to spend some time with my mother. I love just spending fun times with my family. my favourite part is the food! The festive cheer - decorations on the streets, fairy lights, cinnamon scented everything. I live away from home so my favourite part of Christmas is having some time off work and going home to spend some quality time with my friends and family. The build up and the excitement on the kids faces as they go to bed on Xmas eve. Watching the kids opening their presents.